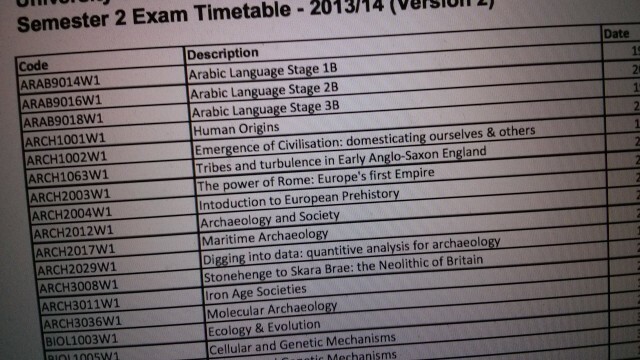 The full schedule for the forthcoming exam period has been revealed. The document – which can be accessed here – features over 700 exams spread across the three week exam period. However, students are warned that the timetable currently online is only a draft, and exam dates may change closer to the date. Personal exam timetables will be confirmed through SUSSED on 5 May. Students are encouraged to contact their Academic President as soon as possible if any exam clashes are noticed. The summer exam period will take place from Monday 19 May until 7 June, excluding the spring bank holiday on Monday 26 May. The period coincides with Hartley Library’s updated opening hours which will see the building open for 24 hours from Sunday to Saturday. « Have you been to the Stags…?